I love my reusuable bags, but they are awfully boring. When I take them into the grocery store, I really don’t care what they look like, but when I use them shopping at other stores, I kind of feel like a bag lady. The solution: a stylish reusable bag by Green Girl. 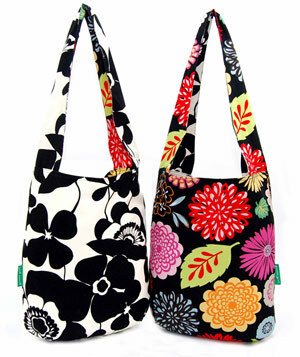 Green Girl Totes are made of 100% cotton (wish it was organic cotton), are reversible, reusable, and stylish. Designed for eco-conscious women with an eye for style, Green Girl’s hip line of reusable totes is turning heads with a unique “Earth-first” fashion statement. Made of machine washable, 100% cotton, reversible Green Girl eco-totes hold an almost unbelievable amount of goods while folding compactly enough to fit in a purse. From the farmer’s market to a shopping spree, you will love using this stylish combination of eco-friendliness and fashion time after time. Each bag ships with a silver ring to keep it conveniently wrapped for easy travel! The bags all measure 15 1/2 inches wide x 17 inches long (not including handle). Really, I am not that self-conscious that I need a stylish reusable shopping bag over my well-used hemp ones, but Green Girl totes are very nice. I do think having a separate more fashionable reusable bag will help me remember to take my bags in more stores than just the natural foods coop though. I truly believe you can never have too many reusable bags, especially when they are made in the USA like Green Girl Totes.